GALION – The Galion High School inducted 12 new members into its National Honor Society on Monday. This year’s inductees include: Sari Conner, Alexandria Eckert, Wyatt Enders, Kiersten Gifford, Kaylyn Gimbel, Gabrielle Kaple, Clay Karnes, Jalyn Oswald, Danielle Schneider, Colten Skaggs (Senior), Maranna White (Senior) and Elizabeth Wolf. They joined current members Alexandria Awbrey (Secretary), Elise Barnhart, Allison Bauer, Cheyenne Blair, Chase Castline, Allison DeNero, Josielyn Ehrman, Erica Eidt, Luke Eisnaugle, Tyler Harris, Teresa House (Vice President), Claire Miller, Ashlie Sallee (President), Marissa Snyder and Briana Streib (Treasurer). Each new member had a photograph taken by Photorama of Galion. 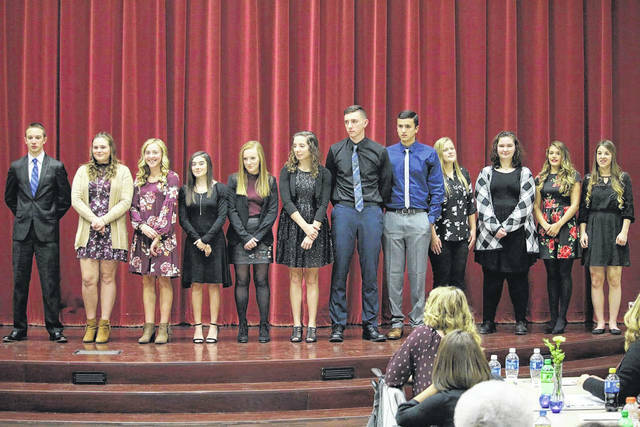 Photo courtesy Cindy Connor Twelve students were inducted into the National Honor Society on Monday night at a ceremony at the Galion High School cafetorium. https://www.galioninquirer.com/wp-content/uploads/sites/38/2017/11/web1_23600874_10155061438646444_1976668633_o.jpgPhoto courtesy Cindy Connor Twelve students were inducted into the National Honor Society on Monday night at a ceremony at the Galion High School cafetorium.